This article is about the song by Buffalo Springfield. For other uses, see For What It's Worth (disambiguation). "What's that sound?" redirects here. For the album by Haley Reinhart, see What's That Sound? "Do I Have to Come Right Out and Say It?" (1966) "For What It's Worth"
"For What It's Worth (Stop, Hey What's That Sound)" (often referred to as simply "For What It's Worth") is a song written by Stephen Stills. Performed by Buffalo Springfield, it was recorded on December 5, 1966; released as a single on Atco Records on December 23, 1966; and peaked at No. 7 on the Billboard Hot 100 chart. It was later added to the March 1967 second pressing of their first album, Buffalo Springfield. The title does not appear in the lyrics because it was added after the song was written. Although "For What It's Worth" is often used as an anti-war song, Stephen Stills was inspired to write the track because of the Sunset Strip curfew riots in November 1966—a series of early counterculture-era clashes that took place between police and young people on the Sunset Strip in Hollywood, California, beginning in mid-1966, the same year Buffalo Springfield had become the house band at the Whisky a Go Go on the Sunset Strip. Local residents and businesses had become annoyed by how crowds of young people going to clubs and music venues along the Strip had caused late-night traffic congestion. In response, they lobbied the city to pass local ordinances stopping loitering, and enforced a strict curfew on the Strip after 10 p.m. The young music fans, however, felt the new laws infringed upon their civil rights. On Saturday, November 12, 1966, fliers were distributed on the Sunset Strip inviting people to join demonstrations later that day. Several of Los Angeles' rock radio stations also announced a rally outside the Pandora's Box club on the corner of Sunset Boulevard and Crescent Heights. That evening, as many as 1,000 young demonstrators, including future celebrities such as Jack Nicholson and Peter Fonda (who was handcuffed by police) gathered to protest against the curfew's enforcement. Although the rallies began peacefully, trouble eventually broke out. The unrest continued the next night, and periodically throughout the rest of November and December, forcing some clubs to shut down within weeks. It was against the background of these civil disturbances that Stills recorded "For What It's Worth" on December 5, 1966. Stills said in an interview that the name of the song came about when he presented it to the record company executive Ahmet Ertegun (who signed Buffalo Springfield to the Atlantic Records-owned ATCO label). Stills said: "I have this song here, for what it's worth, if you want it." Another producer, Charlie Greene, claims that Stills first said the above line to him, but credits Ahmet Ertegun with giving the single the parenthetical subtitle "Stop, Hey What's That Sound" in order that the song would be more easily recognized. The song was recorded on December 5, 1966 at Columbia Studios, Hollywood. Tom Dowd claimed he mixed the song at Atlantic's studio in New York, though this has been disputed. Dowd did take part in the production of Cher's version of the song in 1969. The song is distinguished with the use by Neil Young of the "guitar harmonics" technique and sound. "For What It's Worth" quickly became a well-known protest song. In 2006, when interviewed on Tom Kent's radio show Into the '70s, Stills pointed out that many people think the song is about the Kent State shootings of 1970, even though its release predates that event by over three years. Neil Young—Stills' bandmate in both Buffalo Springfield and Crosby, Stills, Nash & Young (CSNY)—would later write "Ohio" in response to the events at Kent State . An all-star version of "For What It's Worth" with Tom Petty and others, was played at Buffalo Springfield's induction by Petty to the Rock and Roll Hall of Fame in 1997; Young did not attend. 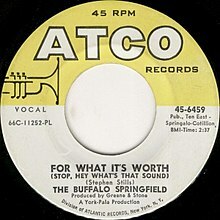 "For What It's Worth" has been covered, sampled, and referenced in numerous musical performances. Versions include those by The Staple Singers (US #66 in 1967), Rush, Cher, Oui 3 (UK #28), Queensrÿche (on their album Take Cover), Miriam Makeba (on her album Keep Me in Mind), Public Enemy, Ozzy Osbourne or (həd) p.e. (retitled Children). Cher's 1969 cover did not make the Billboard Hot 100; AllMusic retrospectively called her version "mature [and] forceful". David Cassidy recorded an extended live version for his 1974 album Cassidy Live! (Bell Records, UK #9; recorded live in Great Britain in May 1974). The track features extensive and complex lead-guitar solos by Cassidy himself. The hip-hop group Public Enemy sampled "For What It's Worth" on their 1998 song "He Got Game", which also featured Stephen Stills. Oui 3 adapted the song for their 1993 debut single of the same name, which reached number 26 in the UK chart. In 2017, Haley Reinhart released a cover of the song as the third single from her third studio album, What's That Sound? ^ Unterberger, Richie. "Great Moments in Folk Rock: Lists of Author Favorites". Richieunterberger.com. Retrieved 2011-01-26. ^ Fontenot, Robert. "What is Country Rock?". ThoughtCo. About.com. Retrieved March 12, 2017. ^ Jim DeRogatis (1996). Kaleidoscope Eyes: Psychedelic Rock from the '60s to the '90s. Carol Publishing Group. p. 51. ISBN 978-0-8065-1788-9. Retrieved 13 October 2015. ^ Inc, Nielsen Business Media (25 March 1967). "Billboard". Nielsen Business Media, Inc. – via Google Books. ^ a b c David Browne (November 11, 2016). "'For What It's Worth': Inside Buffalo Springfield's Classic Protest Song". Rolling Stone. ^ Gilliland, John (1969). "Show 34 – Revolt of the Fat Angel: American musicians respond to the British invaders. [Part 2] : UNT Digital Library" (audio). Pop Chronicles. University of North Texas Libraries. ^ a b "Sunset Strip Riots | Closing of club ignited the 'Sunset Strip riots'". Los Angeles Times. 2007-08-05. Retrieved 2012-01-16. ^ Einarson, John; Furay, Richie (2004). For What It's Worth: The Story of Buffalo Springfield. Taylor Trade Publications. p. 127. ISBN 978-0-8154-1281-6. ^ Jimmy McDonough (2003). Shakey: Neil Young's Biography. Random House. p. 201. ^ "Top 20 Pop Spotlight Cher - For What It's Worth". Billboard. Nielsen Business Media, Inc. 16 Aug 1969. ^ Lustig, Jay (18 February 2011). "Song of the Day: 'Rock 'n' Roll Woman,' Buffalo Springfield". The Star-Ledger. Retrieved 19 February 2011. ^ Stevenson, Tommy (20 October 2010). "'Days of Rage' conference revisits unrest of May 1970". Tuscaloosa News. Retrieved 19 February 2011. ^ Lynskey, Dorian. "Neil Young's Ohio – the greatest protest record". The Guardian. The Guardian. Retrieved 5 January 2019. ^ "CSN, Jackson 5 Join Rock and Roll Hall of Fame". Rolling Stone. 8 May 1997. Retrieved 19 February 2011. ^ "Item Display - RPM - Library and Archives Canada". Collectionscanada.gc.ca. 1967-03-18. Retrieved 2019-02-03. ^ Mark Deming. "3614 Jackson Highway - Cher | Songs, Reviews, Credits". AllMusic. Retrieved 2016-09-30. ^ Locker, Melissa (2012-11-05). ""He Got Game" | Public Enemy at 25 | TIME.com". Entertainment.time.com. Retrieved 2016-09-30. ^ "Oui 3". Blair Booth Music. Retrieved 6 April 2016. ^ "Oui 3". Official Charts. Retrieved 6 April 2016. ^ "EXCLUSIVE! Haley Reinhart Covering The '60s Classic For What It's Worth Is As Chilling As Our Current Political Climate! Listen!". PerezHilton. August 10, 2017. Retrieved August 10, 2017. This page was last edited on 7 April 2019, at 01:45 (UTC).